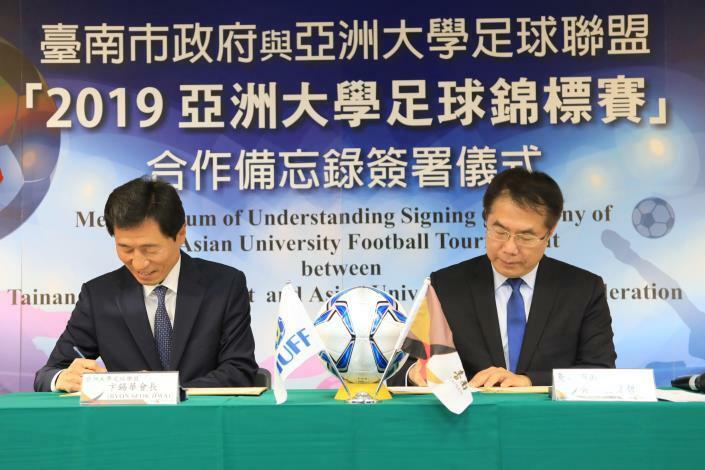 Tainan City government and Asian University Football Federation (AUFF) will jointly host the Asian University Football Tournament (AUFT) this September. On January 4, AUFF President Byon Seok-Hwa traveled to Tainan to sign an MOU with the city government. Tainan City mayor Huang Wei-che attended the press conference in person to complete the signing ceremony. Huang later expressed that he hopes this collaboration can further promote football in Tainan. Mayor Huang remarked that Tainan is a major football city in Taiwan. Tainan football teams in all three levels have performed very well in domestic competitions in the past years, and have also cultivated many star athletes for our national teams. Recently, Tainan City government has been actively building and restoring sports venues. The renovation projects at Yonghua Football Field and Xiaolong Football Field have been completed. The two venues have served as overseas training venues for the Vegalta Sendai Ladies football team from Japan for the past two years. Hopefully these types of international exchanges would encourage Taiwan athletes to participate in more global games, too. 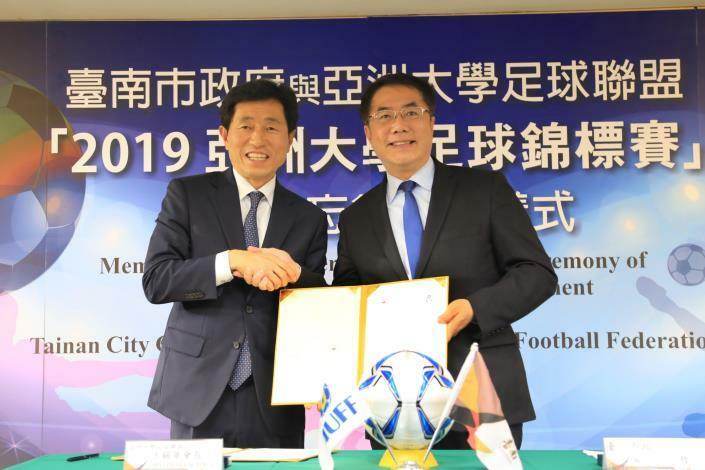 The Mayor also thanked Tainan Municipal Sports Federation Chairman Liu Fu-cai (who is also the Vice President of AUFF) for his years of dedication in promoting football in Tainan City. Huang announced that the Taiwan-Japan-Korea University Football Tournament will start first between Jan. 18 and 20, followed by the Asian University Football Tournament on Jan. 9. He invited all football fans to come and enjoy the games. The Asian University Football Tournament (AUFT) is a regional sports tournament organized by Asian University Sport Federation (AUSF). 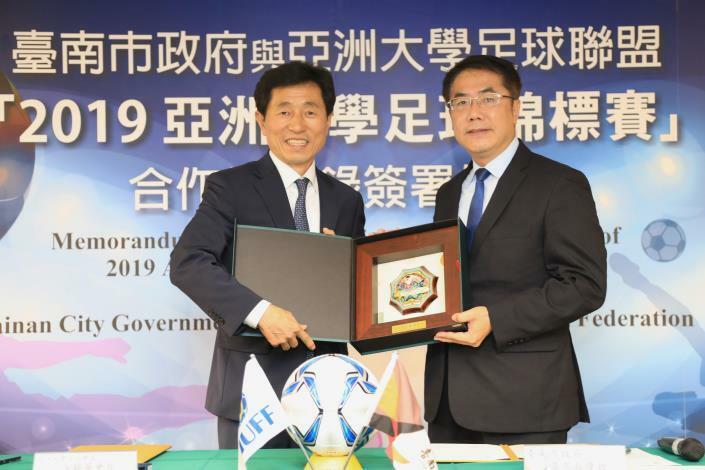 The Asian University Football Federation (AUFF) has been promoting the event since 2014; and thanks to the efforts of Chairman Liu Fu-cai, AUFF selected Tainan as the hosting city for the 2019 Asian University Football Tournament. AUFF President Byon Seok-Hwa led a delegation to Tainan to discuss the collaboration details in October, 2018. 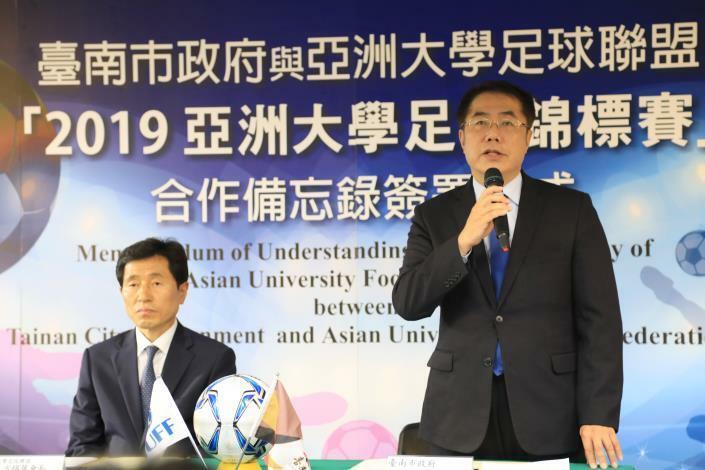 President Byon Seok-Hwa stated that the objective of the 2019 Asia University Football Tournament is to offer Asian university athletes a platform to interact and learn from each other. In addition to various Korean cities, cities in the Philippines and Malaysia are also eagerly applying for hosting rights. So far this sports event in Tainan has been promoted in 44 Asian countries. Foreign student athletes can expect to fully experience Taiwan's delicacies, natural scenery, and local hospitality first hand after they arrive. Tainan City has invested a large sum of budget in restoring and renovating football fields; and the local team won First and Second place in Men's Group category in the 2015 and 2017 national games, respectively. 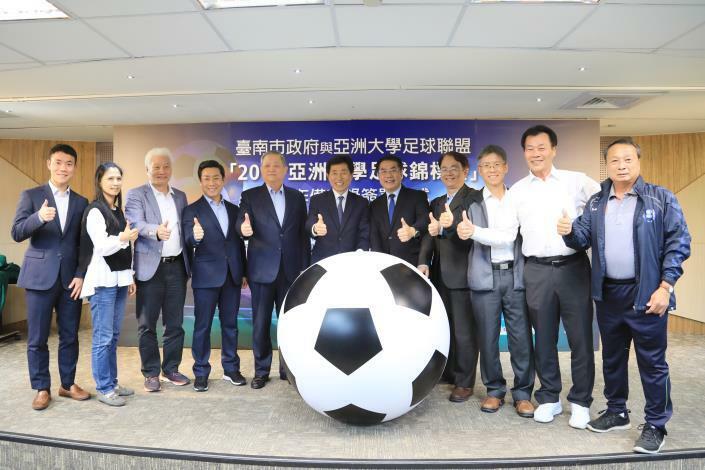 According to the Tainan City Government Department of Sports, the 2019 Asia University Football Tournament is scheduled to be held from September 17 to 28, 2019, and the city expects to welcome and host ten to twelve Asian teams during the event. Before the official tournament kicks off, the Taiwan-Japan-Korea University Football Tournament will first take place between Jan. 18 and 20 this year. The public is more than welcome to come watch the games at the Tainan Municipal Football Field.